With the Affiliate Program, now you can earn money by promoting TradeKey.com. 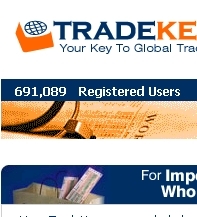 You can earn $.01 simply when your friend visits TradeKey.com; $.20 when he/she registers as a Free member; $30 for each friend who becomes a SilverKey member, and $300 for every friend who becomes a GoldKey member. You can also earn $5 every time you refer a new affiliate to the program.